“Although my artwork is mainly considered representational, I deal with more metaphorical aspects rather than realistic physical evidence. The human body along with other elements: garments, fruit, vegetables, furniture, animals, etc. have been my focus. The images bear a slight resemblance to traditional Japanese Ukiyo-e prints, but also express contemporary aspects of the Western Hemisphere. There are small transitions in my work from time to time, and my interest is always based on unpredictable texture that is printed from the etched surface of the copper plate. My prints explore the complex relationship of paper, ink and etched plates to describe my thought, as well as the relationship which occurs between figures and space to express other human experiences. Always I try to investigate the maximum potential available to me as a printmaker. 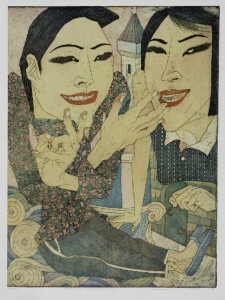 The artist’s technique is extremely demanding, involving etching, dry point, aquatint, soft ground and roulette on a copper plate. Working on extremely thin Japanese paper, he uses relief printing to texture his work from the front and back, also using tools such as emery paper to enhance the lighter areas. The paper is then inset into a stronger Western art paper as it is run through a small press. On page two of this bio, the artist describes his technique. Yujj has exhibited widely in the US and Japan, as well as in the UK, Germany, Spain, Poland, the former Yugoslavia, Finland, China and Canada. 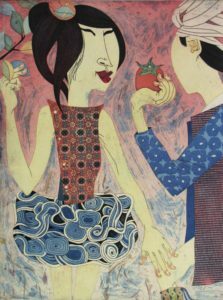 He has an MFA in Printmaking from Indiana University, Bloomington (1980), a BS I Art Education from Tokyo Gakugei University, Tokyo, and has been engaged in his other passion, teaching print making, at Oregon State University since 1992. Cheney Cowles Museum, Spokane, Washington. University of Wisconsin – Parkside, Kenosha, Wisconsin. To start with; the first tones to the plate are given with line-etching, drypoint, aquatint, softground, photocopy transfer or roulette. I pull my first color. With these first impressions, I work back into the plate with a scraper, burnisher, and emery paper to enhance the lights and accent the motif. I then go on to the second, third and fourth colors. Finally, the print is completed from the back with a relief process of woodcut or linocut to intensify shapes and/or colors.